Arthur Henry Hallam would be obscure to us today if his death at the age of twenty-two had not been immortalized in the grief-stricken words of Alfred Tennyson, his closest friend. 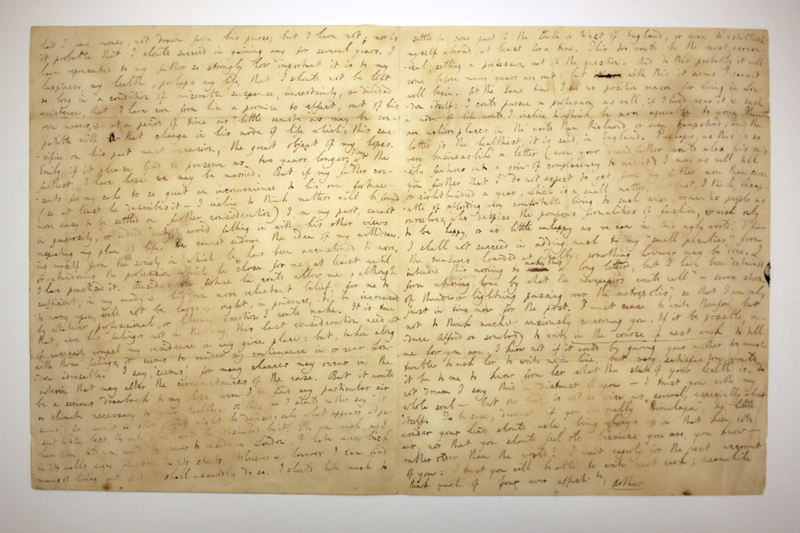 Emily Tennyson, the poet’s sister, was Hallam’s fiancée; this letter captures a relatively late stage in their relationship. Hallam and Tennyson had become friends at Trinity College, Cambridge, where the former matriculated in 1828; in spring 1830, between the Lent and Easter terms of his second year, Tennyson invited his friend to his family home in Spilsby, Lincolnshire, for three weeks. Hallam quickly fell in love with Emily Tennyson, and by early 1831 was referring to her in verse as “my promised wife.” Both fathers of the young couple disapproved of the early connection and forbade further visits to Somersby until Hallam came of age in February 1832. He took his degree early that year and, immediately after entering the Inner Temple in accordance with his father’s wishes, decamped for Somersby at the end of the month for a five-week stay. This letter comes from about three months after the end of that visit. 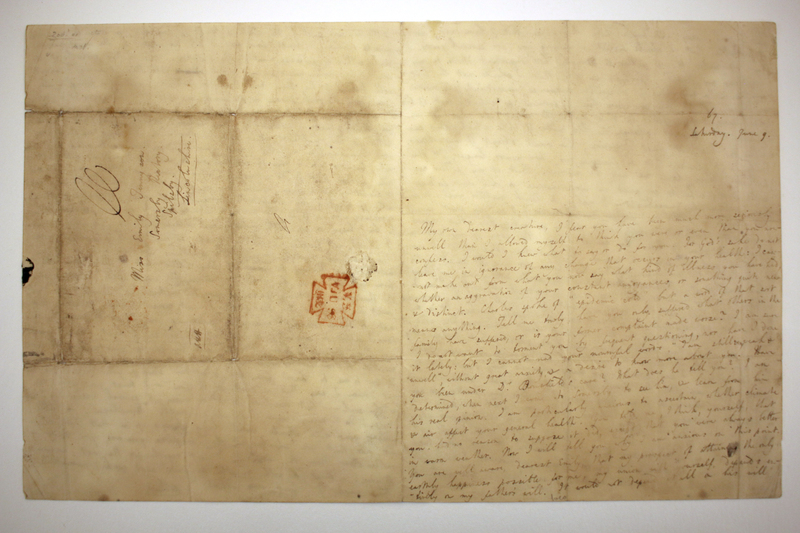 Hallam’s biographer, Martin Blocksidge, writes that the couple established a rhythm in which Emily would write one letter a week for arrival on Saturday; Hallam would then reply by return post. Hallam’s worrying about Emily here—the better part of his twelve-hundred-word letter is spent asking after her health—may seem excessive and badgering, but the entire Tennyson family had a tendency toward hypochondria, and Emily had a habit of being vague about her health. In some sense, the letter shows Hallam at his worst: needy, gushing, and a little overbearing. After spending a page worrying about her health, explaining how marrying her is “the only earthly happiness possible for me,” he adds nonchalantly, “but it would be a serious drawback to my hope were I to find any particular air or climate necessary to your health.” Other letters show them in better moods and happier spirits; this letter unfortunately catches Hallam on a bad day. It offers a fascinating look into its author’s prospects, however, and the barriers that might stand in front of marriage for a couple of equal age and little independent income. Hallam realizes that his marriageability is dependent on how large an allowance his father is willing to give him. Henry Hallam disapproved of the relationship and worried that his son was ruining his chances by rushing into marriage with Emily; there was also a note of snobbery in his treatment of the Tennysons, children of an irate provincial clergyman. Blocksidge speculates that Henry was more than sufficiently well-funded to provide his son with an adequate living, and refused to do so largely out of spite. Still, it is somewhat surprising to read Hallam deprecating an income of “seven or eight hundred a year”: in Middlemarch, set around the same time period, Dorothea and Celia Brooke each receive £700 per annum from their parents’ estate, and Lydgate buys an entire medical practice assessed at £800. At the time that the letters in the collection were first cataloged, this letter had not yet been published; but in 1981 Jack Kolb published it in his book The Letters of Arthur Henry Hallam.